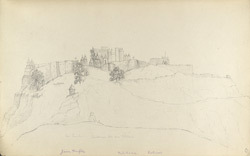 Pencil drawing of the Jain temples of Satrunjaya by George Boyd, from an album of 95 drawings (90 folios), chiefly of landscapes and monuments in the Deccan, W. India and Afghanistan, dated 1821-44. Satrunjaya is an ancient Jain place of pilgrimage where it is believed that Adinatha, the first Jain Tirthankara visited several times and his disciple Pundarika obtained enlightenment. There are many hundreds of multi-spired temples on the two summits of the hill, in the town of Palitana, Gujarat. The sanctuaries are grouped in fortified enclosures or tuks, named after their founders and most date to the 16th century.